Overcast with rain showers at times. Areas of patchy fog. Low 52F. Winds SSE at 10 to 15 mph. Chance of rain 50%..
Overcast with rain showers at times. Areas of patchy fog. Low 52F. Winds SSE at 10 to 15 mph. Chance of rain 50%. 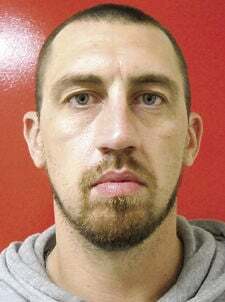 LACONIA — A Farmington man in being held in the Belknap County Corrections facility after being arrested for threatening a Gilmanton woman at gunpoint in her home. According to Gilmanton Police, officers were sent to a Gilmanton Iron Works residence shortly before midnight Friday after receiving a report that a man was threatening a woman with a gun. As officers were driving toward the house they saw the suspect’s vehicle driving away from the area. Officers stopped the vehicle and detained Joshua Mabey, 31, of 15 Orange Road, in Farmington, police said. The occupant told officers that Mabey, who is described in court records as an intimate partner of the woman, verbally threatened to kill her, shoved her against a wall when she tried to stop him from pouring milk down the sink, put a gun to her mouth, and pulled the phone cord out of the wall to prevent her from calling police, according to a police affidavit. Mabey was charged with criminal threatening with a deadly weapon-domestic violence, and two counts of domestic violence for the physical assault and disabling the telephone. According to court documents, Mabey was convicted earlier this year in Strafford County for stalking, false imprisonment, contempt, possession of methamphetamine and simple assault. He was sentenced to one year in the Strafford County House of Corrections. The sentence was suspended for two years on condition of good behavior. Mabey waived arraignment and pleaded not guilty to the latest charges in Belknap Superior Court Tuesday. His bail was set at $10,000 cash or surety.